JALAN SUNGAI UJONG, GEORGETOWN, PENANG. WITH AN ELEGANT TOUCH FROM GEORGE TOWN, PENANG. Kimberley Hotel Georgetown is strategically situated in the heart of George Town Penang, the UNESCO Heritage Site with 116 rooms across a 4 floors historical pre-war hotel building, ideal from leisure to business. Kimberley Hotel Georgetown is strategically located in close proximity to a variety of eateries shopping centres and commercial facilities in the middle of Georgetown. 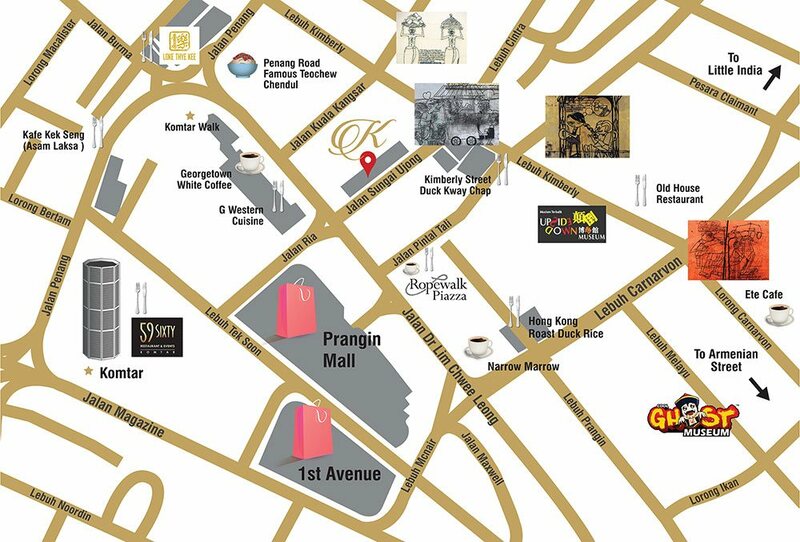 Within walking distance is the famous Penang Georgetown landmark – Tun Abdul Razak Complex or easily known as KOMTAR. The great historical tales of the city of Georgetown can be explored conveniently by walking or cycling under a clear sky of a beautiful weather. Dining with the tang of history in this pre-war building in the middle of Georgetown will definitely be an extraordinary experience. You will surely be enlightened by our chef’s masterpieces. Let us carve a big smile on you and your wonderful companions. No.36 G-02 Jalan Sungai Ujong, 10100 Georgetown Penang.